Oh my.... how time flies! I hope everyone enjoyed their time over Christmas and New Years. It's just a busy time of year, and it feels nice to finally be getting back into the swing of things. It's been FAR too long since I've updated things here. So I thought I'd write a note to say hi to everyone.... please let me know how you're doing and if there's anything you'd like to see added to the collection or to my website in 2013! 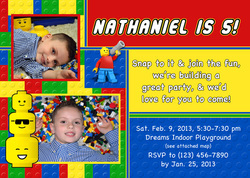 Here's a newly added Birthday Card - bright and fun - LEGO! There is also a matching Thank You Card that you can find under "Thank You's" in the Gallery. Here's to a new, fun, and prosperous 2013 for us all! Several New Christmas Cards have been added, as well as a new boys, contruction themed, birthday card. Please contact me if you have an idea that don't already see on my site, I'd be more than happy to work with you! 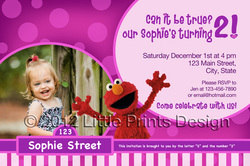 3 New Elmo invitations added! These are all girlly Elmo's at the moment, but there are "boy coloured" options to come, as well as primary colours. Thank You's will also be added soon! Some new Halloween invitations/greetings have been uploaded!! Check them out... turn around on them is 12-24 hours. You can have them in your hands today! Please let me know what you think of the new look! Lots of things in the works! I just made and updated a new page for Thank You cards, I'll be adding more of these and will have matching thank you's for every invitation style. I'm also looking into an expansion... all of these things are keeping me very busy!! Can't wait to reveal more.... hopefully soon!! Updates to the image gallery are complete!! I've added a new section, baby shower invites - as I recently had a request for that. I'll continue to add more options to that area as I finish them. I've also added a couple of new options to the birthday invite gallery. Give me an M! Give me an I! Give me a C! Give me a K! Give me an E! Give me a Y! What do you have?? Mickey Mouse!!! The matching thank you cards will soon be added as well. So I finally had my first few customers since starting this site! I've had a lot of fun designing for them :) Now to update with new images!! They're coming VERY soon. We had a two week break were we went on vaca to Barachois (Gaspé/Percé area) Quebec. The kids had a blast... and it was great to visit with my grandparents. A special thank you to my parents, Gilda and Ovelyn for making it possible! !